Despite the unrest in Syria, Afghanistan is the source for 25% of the world’s refugees, with Pakistan and Iran hosting 95% of them. Despite the situation in Syria and the ongoing unrest in the Arab world, South Asia—largely thanks to Afghanistan— remains the region where the largest numbers of refugees originate from. Ahead of world refugee day on Thursday, on Wednesday the UN High Commissioner for Refugees (UNHCR) released its annual report on the globally displaced people. Among its major conclusions was that the 45.2 million people who were displaced worldwide at the end of 2012 was more than had been displaced at any time since 1994. Of these over 45 million people, about 15 million were refugees. At the end of 2011, 42.5 million people were displaced. Although Syria and the Arab world were largely to blame for the spike, Afghanistan continued its long-running streak of being the largest source of refugees worldwide. “With close to 2.6 million refugees in 82 countries, Afghanistan remained the leading country of origin of refugees in 2012,” the UNHRC wrote in its report. Because of that, other parts of South Asia are the recipients of the largest number of refugees in the world. First among these are Iran and Pakistan—Afghanistan’s western and eastern neighbors— which together host some 95 percent of Afghan refugees. With over 1.6 million refugees at the end of 2012, Pakistan was by far the country with the most foreign refugees living in the country. And this only includes registered refugees; according to the Pakistani daily, Dawn, an additional 1.6 million unregistered Afghans are living in Pakistan (some place the number at 600,000). The overwhelming number of them are located in Pakistan’s North-West Frontier Province (now called Khyber Pakhtunkhwa). The Pakistani government has issued a June 30 deadline for all Afghan refugees to leave the country or face retribution. Almost no observers find this realistic, however, and Pakistan has issued similar deadlines in the past only to extend them. Iran was the next highest country in terms of the amount of refugees—868,200— it hosted at the end of 2012. The overwhelming majority of these refugees are from Afghanistan, although a small percent from Iraq. This inflow of refugees has put enormous strains on both Pakistan and Iran. In Pakistan, these problems are exacerbated by the fact that Afghanistan and Pakistan dispute their border at the Durand Line. Afghanistan technically does not recognize the legitimacy of the Durand Line and instead lays claim to the NWFP in Pakistan, where most of the Afghan refugees are located. In Iran, on the other hand, there has long been concerns about the border with Afghanistan due to the inflow of narcotics from the war-torn country. The UN has estimated that 60 percent of Afghan opium transits Iran on its way to other markets. However, not all of it passes through Iran. In the past, Iran was believed to have the highest number of opium addicts per capita and in 2010 the UN estimated that 42 percent of all non-heroin opium consumption occurred within Iran’s border. Iran’s ability to handle its large Afghan refugee population has also declined as its economic situation has worsened under increasingly harsh Western sanctions over its nuclear program. Still, some progress has been made on the Afghan refugee issue. 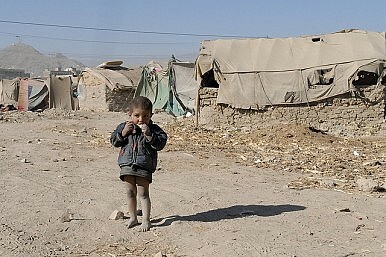 Between 2002 and 2012, for instance, the UNHCR estimates that it helped 902,000 Afghans living in Iran return home. Of the more 500,000 refugees who voluntarily returned home across the world in 2012, over 98,000 of them were Afghans. The Afghan Endgame: What, When, and HowThe Afghan National Unity Government’s ‘China Card’ Approach to Pakistan: Part 2A War of Words? Conflicting Media Narratives Between India and PakistanNew Trends in Pakistan-Saudi Arabia TiesWill Pakistan's Wall Work?